The cyclamen mite, Phytonemus pallidus (Banks), (family Tarsonemidae), was first noticed in New York in 1898 and in Canada in 1908. The cyclamen mite was described by Banks (1901) as Tarsonemus pallidus from leaves of greenhouse chrysanthemums at Jamaica, New York. Today, it is generally distributed throughout the country. Ewing (1939) considered Tarsonemus fragariae Zimmermann and Tarsonemus destructor Reuter to be synonyms of Tarsonemus pallidus Banks. Beer (1954) placed it in the genus Steneotarsonemus. However, Linquist placed in it the genus Phytodromus in 1987. The mites are often found on the corms of cyclamens in storage and are thus transported by trade. It has been spread to all parts of the world on plants in unopened leaflets and on the tubers of cyclamen. This mite requires high humidity and avoids light. It overwinters in the adult stage in the temperate zone. It is widely distributed throughout North America, Hawaii, Europe and Asia. Figure 1. Adult female cyclamen mite, Phytonemus pallidus (Banks). Graphic by Dr. E.E. Lindquist. Tarsonemus pallidus Banks, 1901: 294. Tarsonemus fragariae Zimmerman, 1905: 91. Steneotarsonemus pallidus (Banks), Beer, 1954: 1267. Phytodromus pallidus (Banks), Lindquist, 1987: 291. This is one of the smaller mites that attacks ornamental plants. The adult female mite is yellowish brown, 250µ to 260µ long, with hind legs reduced to slender threadlike structures. The male is approximately 75% the size of the female. On the adult males the fourth pair of legs is modified and used to transport the pupae or adult females. The eggs are relatively large (125µ X 75µ). They are elliptical, opaque, smooth and nearly twice as long as wide (Jepperson, Kefer and Baker, 1975). The larvae are opaque white with a peculiar triangular enlargement at the posterior end of the body. The pupae are non-motile. The mouthparts consist of stout, paired palpi of indistinct segmentation inserted on the apical portion of the capitulum. The slender, styliform, paired chelicerae are also part of the mouthparts and are inserted into plant cells when feeding. The cyclamen mite may be confused with the broad mite, Polyphagotarsonemus latus (Banks), but the broad mite is broader, smaller, and moves much faster. Figure 2. Adult male cyclamen mite, Phytonemus pallidus (Banks). Graphic by Dr. E.E. Lindquist. One to three eggs are laid per day in clusters, with a total of 12 to 16 eggs per life span. The duration of the egg stage is three to seven days, one to four days for the larvae, two to seven days for resting pupae or one to three weeks per generation (Smith and Goldsmith, 1936). The cyclamen mite is a pest of many ornamental flowers and shrubs such as cyclamen, African violet, begonia, gerbera, ivy, chrysanthemums, geranium, fuchsia, larkspur, petunia, snapdragon, and other greenhouse grown plants. If the humidity is high, field grown strawberries also may be infested. Figure 3. A strawberry plant damaged by cyclamen mite, Phytonemus pallidus (Banks). Leaf petioles are short, blades are small, thickened and wrinkled, and total growth is stunted. Photograph by James F. Price, University of Florida. 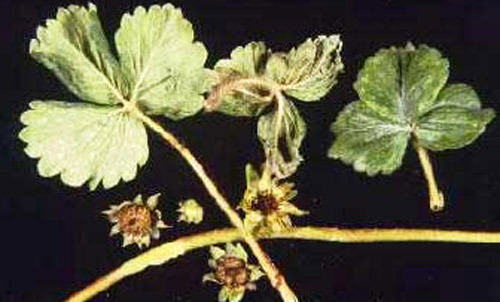 Infested plants may have a streaked and/or blotched appearance, distorted leaves with small distorted flowers, fewer flowers than normal or complete abortion of flower buds. 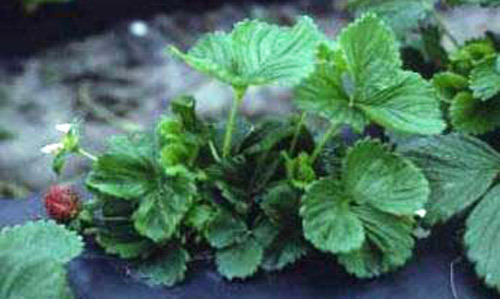 Infested strawberry plants produce a roughened, wrinkled upper leaf surface, irregular folding and fluting of the leaf margins, and veins that bulge upward like blisters. 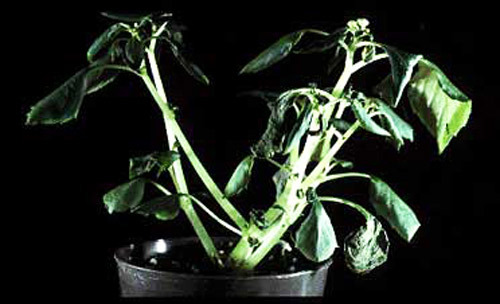 Plants with mild injuries assume a dense appearance because petioles fail to elongate. A heavy infestation will kill African violets and cyclamens by dwarfing the leaves at the crown, with some leaves failing to open. Figure 4. Strawberry leaves and flowers damaged by cyclamen mite, Phytonemus pallidus (Banks). The flowers are dead. Photograph by James F. Price, University of Florida. Figure 5. Damage to Impatiens sp. by the cyclamen mite, Steneotarsonemus pallidus (Banks). Photograph by University of Florida. Unless African violets are examined carefully periodically, the cyclamen mite can be easily overlooked. This mite causes damage by sucking out plant juices, causing cells to collapse and providing entry points for plant diseases. This can lead to symptoms of damage such as leaf curling and leaf dying, before the mites are observed. Great care should be taken to avoid introducing this pest into greenhouses on plants, hands, or clothes. The mites are transferred from plant to plant byroutine cultural practices, drafts of air, and close proximity of plants. Since cyclamen mites are parthenogenetic, one will soon produce a mite colony large enough to cause damage and spread to surrounding plants (Garman 1917). Look for distorted, dwarfed, irregular folding of leaves, thickening of leaves or shortening of petioles. Figure 6. 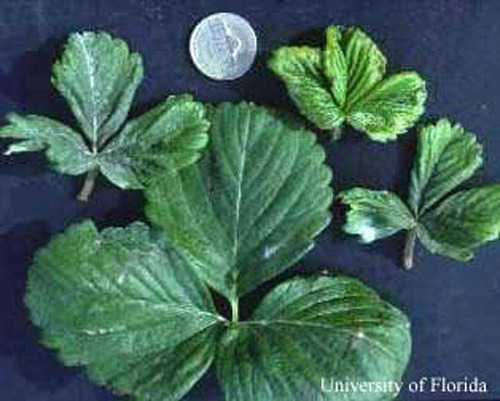 One normal, large undamaged strawberry leaf compared with three leaves damaged by cyclamen mite, Phytonemus pallidus (Banks). Photograph by James F. Price, University of Florida. The egg, larvae, pupae and adult stages are often well protected from chemical control in the leaf and/or flower buds. Mites on planting stock may be completely killed by immersion in water at 43.5°C (110°F) for 30 minutes. Banks N. 1901. Tarsonemus in America. Proceedings of the Entomological Society of Washington 4: 294-296. Beer RE. 1954. A revision of the Tarsonemidae of the western hemisphere (Order, Acarina). University of Kansas Scientific Bulletin 36, Pt. 2: 1091-1387. Ewing HE. 1939. 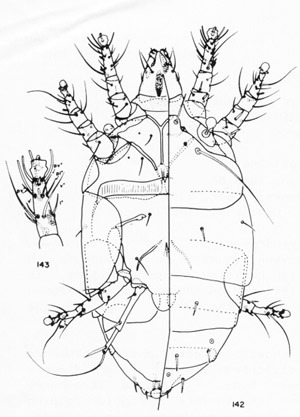 A revision of the mites of the subfamily Tarsoneminae of North America, the West Indies, and the Hawaiian Islands. U.S. Department of Agriculture Technical Bulletin 653. 64 pp. Garman P. 1917. Notes on Tarsonemus pallidus Banks (Acarina). Journal of Economic Entomology 10: 503. Jepperson LR, Keifer HH, Baker EW. 1975. Mites Injurious to Economic Plants. University California Press, Berkeley I-XIX, 1-613. Linquist EE. 1987. The World Genera of Tarsonemidae (Acarina: Heterostigmata): A morphological, phylogenetic and systematic revision with a reclassification of family-group taxa in the Heterostigmata. Memoirs of the Entomological Society of Canada, No. 136. 517 pp. Smith FF, Goldsmith EV. 1936. The cyclamen mite, Tarsonemus pallidus, and its controls of field strawberries. Hilgardia 10: 53-54. Author: H.A. Denmark (retired), Florida Department of Agriculture and Consumer Services, Division of Plant Industry. Originally published as DPI Entomology Circulars 25, 177 and 306. Publication Date: December 2000. Latest revision: July 2014. Reviewed: December 2017.